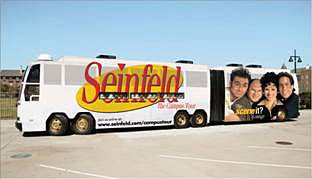 For some reason, Seinfeld is hitting the road. Not Jerry Seinfeld, a nationwide bus tour celebrating the popular ’90s sitcom. Think of it as a Weinermobile about nothing. The bus rolls into Madison in late October and I plan on stopping by. If nothing else I can get myself a cookie, play some Scene-It and ask the kids on the bus how they got such a sweet gig. Here’s the website for more info on the tour. If it stops in your town before mine, tell me how it goes. Don’t yada yada yada over the exciting parts. 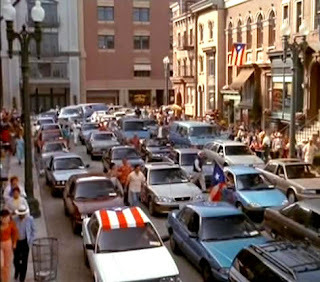 The Puerto Rican Presidential Primary is today, and Hillary Clinton likened her campaign experience there to “..one big Puerto Rican Day Parade.” All of the commotion around PR, the primary made me think of a now infamous episode of Seinfeld. The episode featured the gang trying to get home after a Mets game. Because of the traffic from the Bronx Puerto Rican Day Parade and an abrasive driver in a Maroon VW Golf, Elaine, Jerry, George, and Kramer split up. Hilarity ensues for the entire cast, but the comedy was short lived. Leaders in the Puerto Rican community called on NBC to apologize, as the scene blurred the lines between comedy and racism. NBC made an official statement and apologized. They promised to never aired the episode again (though it was the second to last episode of the show ever) and they originally removed it from the syndication package. However, the episode re-appeared in 2002 with the flag burning scene. Just a little Seinfeld history for you on this Sunday afternoon. Which Seinfeld Clip Would Be Appropriate…. Jerry Seinfeld could’ve died on Saturday. His brakes went out and the comedian was forced to pull the e-brake. His 1967 Fiat flipped once and almost skidded into a busy intersection. Seinfeld walked away unscathed but I couldn’t help but wonder; What YouTube clip would I have picked in tribute? Only one could come to mind, and it actually exists on YouTube. The story started simply enough. 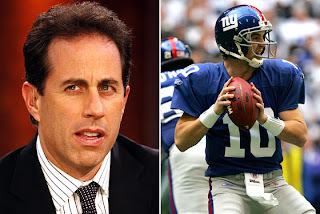 Jay Zollar, General Manager of the Fox affiliate (WLUK) in Green Bay, said he is pulling the 5:30 PM re-run of Seinfeld from the air on Saturday so Eli will be out of his element for the NFC Championship. Not only that, but the station will air God, Family & The Green Bay Packers instead. This whole story would have been a lot funnier if Manning’s favorite show was really embarassing. Something like Still Standing or One Tree Hill. Wishful thinking. George Steinbrenner is reportedly giving up control of the New York Yankees and passing it on to his sons Hal and Hank. What will I miss about the Steinbrenner era? Nothing. Except of course, Larry David’s charming impersonations of him from Seinfeld. This scene is one of my favorites. Feel better heartbreaker. Enjoy your golden years.